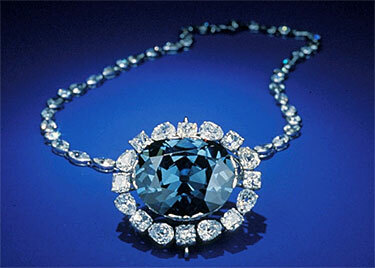 The Harry Winston Gallery houses the Hope Diamond, in a specially designed case. the Carmen Lucia Ruby, weighing 23.1-carats, is one of the largest faceted Burmese rubies known to exist. The stone is set in platinum and flanked by 2 triangular colorless diamonds measuring 1.1 and 1.27 carats. The Minerals and Gems Gallery features some 2,000 specimens grouped by shape, color, growth, and other characteristics. The Mine Gallery features a re-creation of 4 mines showing crystal pockets and ore veins in created dioramas. The Plate Tectonics Gallery illustrates how earthquakes, mountain chains, and volcanoes result from the constantly shifting plates of the Earth's surface and features the "Plate Tectonics Theater" and interactive computer stations. The Moon, Meteorites, and Solar System Gallery explores the birth and evolution of our solar system through films, computer interactives, and specimens and features moon rocks, a touchable Mars rock, meteorites, and stardust. The Rocks Gallery focuses on how rocks record and verify the geological processes that have shaped our planet—erosion and deposition, which destroy and create rocks on Earth's surface and heat and pressure, which transform and melt rocks within the Earth.